No, you do not need to be training to climb a mountain, run a marathon, wear special clothes, or pay money to join a gym or fitness club. Two recently published studies have shown (and confirmed) that simple walking can truly optimize your chances of living a longer life. The second study appeared yesterday, January 22, 2008, in an early online edition of the journal Circulation. The largest study of its kind showed that easily achievable levels of exercise (moderately paced walking 30 minutes per day for 4-6 days/week) led to a fitness level associated with 50% reduced risk of premature death from all causes for both black and white older men. I don't know if there is a drug on the market for anything that will offer that level of risk reduction. Certainly there is NO drug available for so low a cost, so many potential benefits, and with so little risk of harmful side effects. STOP waiting for more studies to be done. In fact, if I could wave a magic wand, I would stop our government from spending any more money on this type of research. I hope your doctor is asking you about your exercise plan. In fact, if he is not asking about exercise, ask why he is not asking you about your exercise plan. Do you get the idea that I am passionate about this? :-) In fact I am so passionate that I am not waiting for my doctor(s) to start asking me about my exercise plan, I am going to start asking them about their plan. Ha, ha, I'm kidding, right? - no, I am serious!!! I used to have some excuses myself. I used to say I never went outside when it was below zero degrees. I used to say that I never went outside when there was ice on the sidewalk. Well, now I wear long underwear, and one of my son's gave me some ice-gripper things to put on my boots. So now I truly am outside every single day, even in snowy, cold, cold Michigan during the winter. 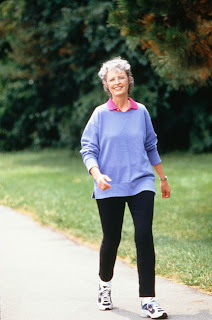 My motivations are two-fold: keeping my cancer away (several studies have shown reduced risk of breast cancer recurrence with increased amounts of walking - I prefer social visits with my doctors over treatments!) and being strong and fit enough to enjoy all of life's opportunities for a long, long time. I haven't said a single word about food in this posting, such as the importance of eating healthy foods for the energy needed to exercise in order to enjoy life. However, I'll end with a grace that reminds us that the gift of food is vital to life. we are feeding one another's spirits. So receive - and give - the food of your life as the powerful gift it is. Glad you're getting outside every day, and this news is very affirming of why i consciously decided to live close enough to walk to and from work. Hi Diana, thanks for the reminder about the walking. You are right, it is so good for you! Just the motivation I needed, too! I had been walking several times a week, but took a little break to rest my ankles (long story....involves a new aerobics class, old sneaks, and a bad floor) I do plan to start up walking again, and the aerobics too, but slowly and with the right sneaks this time! I've been reading your blog for some time now and enjoy it very much. Thank you for your inspirational postings.